The other three children were already in bed. Olivia (four and a half) had fallen asleep on the couch for several hours after her first-ever youchien playdate. Thus getting to stay up late. She and I were taking a shower together, Japanese style. I had just read them a sweet children’s book about a little fox who got adopted (God Found Us You). In the shower, she pointed to my tummy and said, “But Mommy, I still came out of your tummy, didn’t I?” I could tell how much she wanted me to say yes. Of course, I said no – that like we’ve talked about before, she had been born from Miss Yukie, her birth mother’s tummy, but that I became her forever mommy. I told her again more of her birth story. And then the killer question. I hugged her tighter, and tried not to let her hear the catch in my throat. It was one of those moments of motherhood that may remain frozen in my mind and heart forever. Her eyes were so wide, looking for answers, as the shower water spilled over her beautiful long hair. Miss Yukie didn’t have a husband, and knew that baby Olivia needed a daddy and a mommy. And baby Olivia needed a FOREVER Mommy and Daddy. So Miss Yukie prayed for a mommy and daddy who could love Olivia forever and ever. And we had been praying for children who we could love forever and forever since Mommy couldn’t grow babies in her tummy. So God gave us special Olivia. She asked if her first mommy’s daddy (husband) had died. I said I don’t think so. So what happened to him? I don’t know, I said (we really don’t). But Miss Yukie wanted to make sure that baby Olivia would have a Mommy and Daddy who could love her forever. And that’s us! Did she meet you at the airplane and hand me to you? (I think this was adapted from part of Ian’s adoption story, the one she is most familiar with). 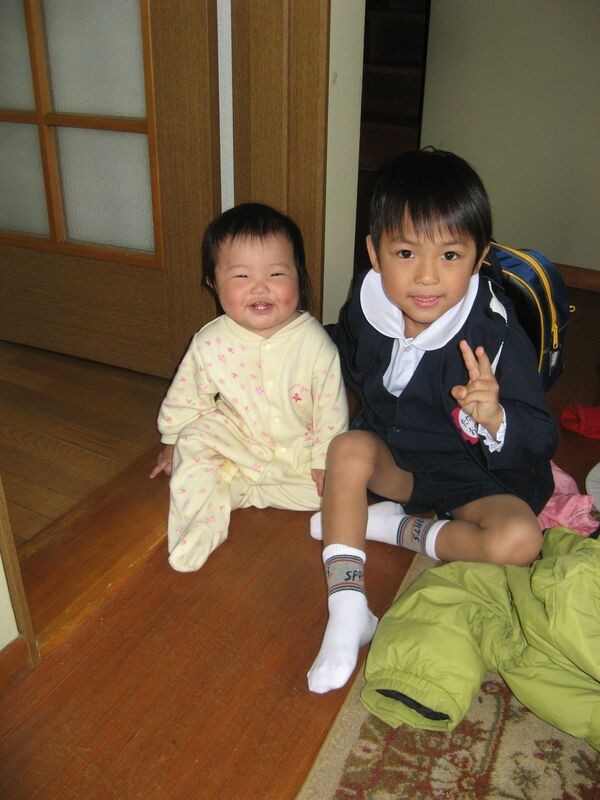 I shared with her again how her older brother and sister and Daddy and I took the fastest train in Japan up to Shizuoka where she was at Aunt Sarah’s house. And how Mommy cried when Aunt Sarah placed her in my arms because I was so happy. 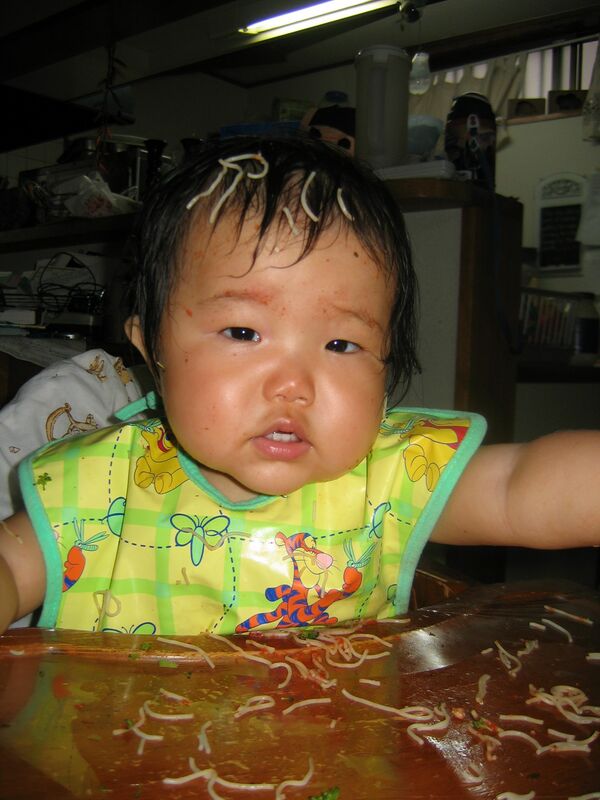 she wanted to show Daddy the picture of her with spaghetti all over her face and high chair. She went up the stairs to bed with a big smile on her face; I melted in the kitchen in tears. I don’t think any mom is ever ready for this question. Annie first asked the question on one of the hardest days I’ve had in years, perhaps – August 25th, the day we were flying from New Jersey back to Japan. It had been a hellacious day on my levels. Annie and Olivia were in the back seat; my sister Beth and I up front as we drove towards the airport hotel where we were staying. Out of the blue, Annie wanted to know why her birth mother didn’t want her; why she couldn’t meet her birth mom; why she lived far away and never tried to call Annie; why we couldn’t shout real loud when we got back to Japan so Miss Yukie would know that Annie wanted to meet her and she would come. Olivia, at that time, was in her own world, singing songs in the back seat. But tonight she was very much in the present. I know our children’s losses as babies will surface again and again, ready or not. We are committed to being open and truthful parents; praying that God gives us great wisdom each time to say as much as each child needs but not too much. And being real too… telling Olivia tonight how sad I am that she wasn’t born in my tummy like I had wished. 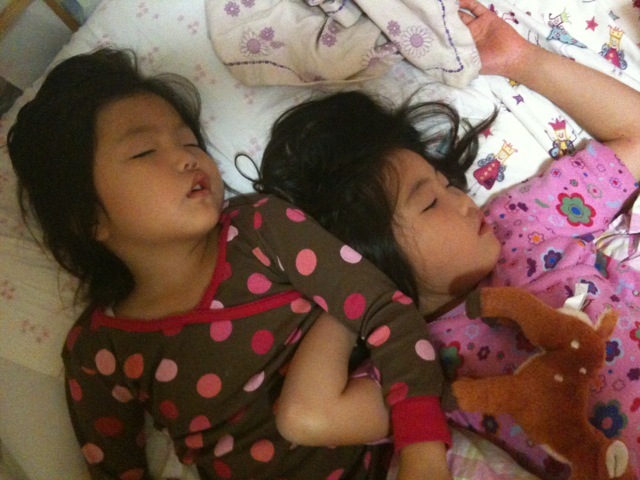 As I went up a few minutes ago to check on our children, I found the girls sound asleep, huddled together in Olivia’s bed. Oh Sue… I’m reading this in near tears. My heart broke with you but also was filled with joy at the way you were able to address Liv’s questions. You are the right mom for all four of your children, God found you all for each other. I am continually inspired by you and your family! Thanks for being such an amazing example to me! Love you all!! Sue, thanks so much for sharing this story! Jun hasn’t asked THAT question yet, but, though she knows her story, wants to be born from me. Adoption is wonderful – of COURSE. But painful. Hi Sue,, I read the story from Olivia’s perspective, as always. 🙂 I am so proud of you for being so open and honest with her. My mom was always so good at portraying my birth mom as such a good person, never putting her down even though she was most likely a young teenage mom. That was a great source of help to me when I was very young. Even now, I think of her positively, thanks to my mom. Thanks for sharing! Oh Sue, that story is so heartbreaking and wonderful at the same time. You are the best Mom and all 4 of your children are so blessed to have you and Eric. I understand the hard questions that children can ask, since Billy has asked his own set of hard questions. Please know that you are covered in prayers every day.